If you have a concern about odours from the Edmonton Waste Management Centre please call the City's 24-hour Odour Hotline 311. Utility Services is committed to constantly improving odour management by regularly reviewing best practices and using the latest technology. Ensuring that odour-causing activities are done indoors as much as possible. For example, the Edmonton Composting Facility is fully enclosed and uses odour-controls called biofilters for ventilated air. Using a misting system to treat and reduce odours escaping the open overhead doors at the Edmonton Composting Facility and the Integrated Processing and Transfer Facility (the place where incoming garbage is sorted). This misting system sprays an odour-neutralizing compound in both buildings. Completing the turning of outdoor composting piles before 3 p.m. to reduce potential for odours in the evening. Reducing or stops turning of compost piles during conditions for high potential of odour migration to communities. Processing or transfers solid waste from the Integrated Processing and Transfer Facility using a ‘first in first out’ approach to minimize storage time of waste. Maintaining a water cap over the biosolid lagoons (a water cap is a layer of water over the biowaste, acting as a barrier between the waste and the air). Designing a new biosolids discharge station to help reduce odours from the direct discharge of biosolids into the lagoons. Residents may note that odours seem to be stronger in the evening or early mornings. This is again due to the weather conditions as evenings tends to have calm air masses leading to little or no wind. See the EWMC Odour Control Matrix for a detailed list of our operational activities for reducing odours. As part of the treatment of wastewater at the Goldbar Wastewater Treatment Plant, solids in sewage are heated to kill harmful bacteria. The solid material is then sent by pipeline to the biosolids lagoons at the EWMC. Water caps are maintained on most of the lagoons to reduce odours. A new biosolids discharge station has been designed to help reduce odours from the direct discharge of biosolids into the lagoons. A long term strategy is in place to reduce the overall storage of biosolids in the lagoons. The City is working with citizens to identify and address odours emanating from the EWMC. The Community Liaison Committee consists of citizen volunteers who live in northeast Edmonton and meet with staff of Waste Management Services and Drainage Services. The committee members share information about the impacts of odours in their neighbourhoods and learn about operational activities at the EWMC to address odours. 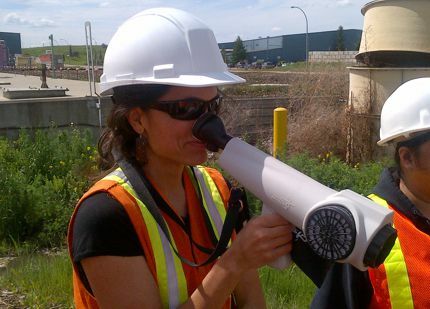 Training offered to members includes Nasal Ranger training in which volunteers learn how to identify and monitor odours. Call centre agents will log your concern and forward it directly to staff at the EWMC and Utility Services. If we receive more than one call from an area within a day, a consultant will visit the neighbourhood and the EWMC to investigate and log information on the odour, as well as wind and weather conditions. We then analyze the data to help us better manage our operations.